The funny thing is, for the past year, I thought I already had an FS podcast channel on iTunes because my random audio versions were showing up on my Podcast feed on my phone. Alas, I realized only I could see my audio versions and nobody else. So finally, after being brutally honest with myself and listening to constructive criticism by my readers, I figured out how to officially set up my iTunes channel and get to work. 1) Tap into a massive new audience. An estimated 112+ million people listen to podcasts at least once a month. That is ~40% of the estimated 12 and over population in America. Monthly listeners are growing by around 20% – 25% a year. Meanwhile, the iTunes platform accounts for around 81% of all podcast listeners. 2) You already have the content. One of the hardest things about podcasting is producing a script. If you’ve decided your blog post is good enough to publish, then it’s simply a meaty script for what you can discuss on your podcast. At the very basic level, you can just read off your post as a podcast. Then you can start adding some nuances that can only be found in the podcast. Finally, you can use your topic to record a discussion between two people to add a new dynamic. 3) You get nice links back from Apple. Not only does itunes.apple.com link back to your main page, each podcast your publish links back to your post in the show notes. Further, the show notes can link back to multiple different posts. 4) You get some nice ego boosting reviews. Even if you don’t deserve the great reviews since you just started and don’t know what you’re doing, you’ll still get some positive reviews from long time readers of your site. 5) You practice your communication skills. Being an effective blogger is all about learning how to connect with your audience. If you create audio versions of your podcast, you will catch yourself wanting to improve your written and oral delivery. So many times I’ve found myself going back to edit my posts and podcasts for better flow. The better you are at communicating, the more traffic you will ultimately receive. 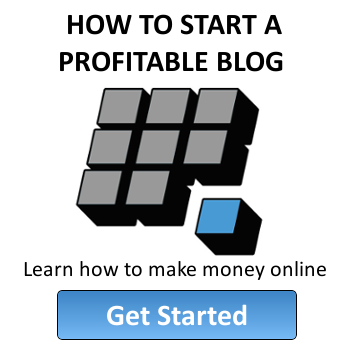 6) You might even make some money! After the first month of launching the Financial Samurai iTunes channel, I was approached by two companies who want to advertise. After six months of podcasting, my podcast makes the business $2,000+ a month. That goes a long way to pay for childcare or school. 7) You build your brand. Adding audio is just another way of building your brand, however you envision it to be. Audio versions help crystallize your message. There is much less ambiguity when you can couple prose with audio. Further, a lot of podcasters DON’T have posts! Having both makes your brand that much stronger. 8) You gain respect from your peers. Part of building traffic is getting mentioned by your peers over social media, in their posts, or podcasts. By starting your podcast, you will naturally attract other podcasters who want to give you a shoutout or interview you. Your peers will also respect you for maximizing your content, as they will want to follow suit. 9) Your children, family, and friends will hear your voice long after you’re gone. One of the main reasons why I wanted to start a podcast was so that just in case of my untimely demise or after I pass away from a natural death, my son and my wife can hear me speak for hours and hours if they start missing me. It’s like listening to a voicemail message from a friend over and over again because you miss him or her, but better. The more topics you can discuss on your podcast, the more you will always be a part of your loved ones. 10) You’ll feel proud of yourself for trying your best. We know from data analytics that around 97% of people never take action because they are either afraid, lazy, or don’t know how to get started. Just by launching your podcast, you become one of the 3% who actually try and do something scary and new. Even if you fail, or even if your podcast goes nowhere, you will find great satisfaction knowing that at least you tried. Never fail due to lack of effort because effort requires no skill! 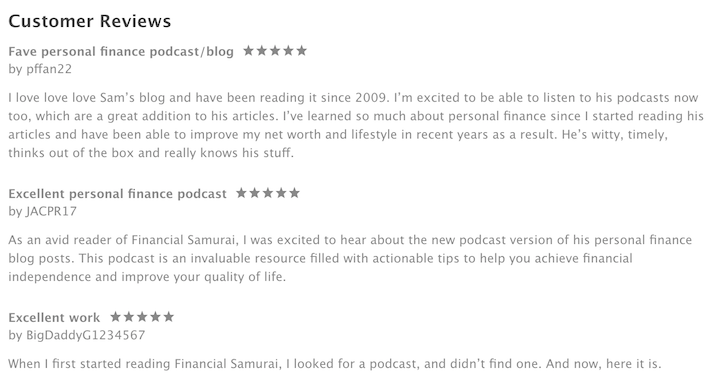 When I started Financial Samurai in 2009, there were already hundreds of personal finance blogs online. People said it was way too late. But boy am I glad I went ahead. Financial Samurai gives me a wonderful outlet in early retirement to connect with other people. The site helps stimulate my creativity as well. 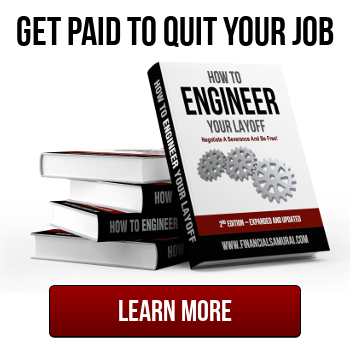 Most of all, Financial Samurai allows me to never have to go back to work again due to the revenue it generates on top of my passive income streams. I see the same thing happening to my podcast in 5-10 years time. 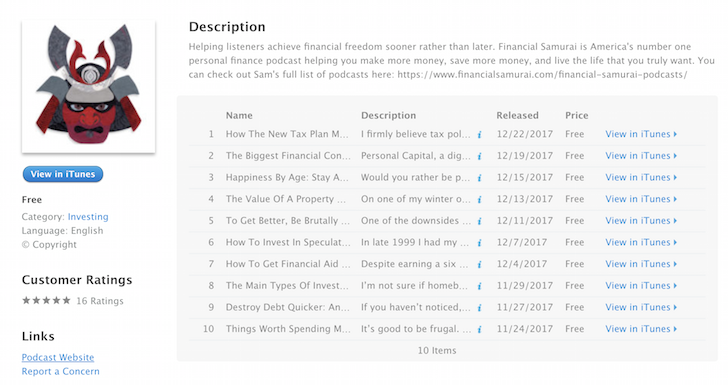 By then I will have published 250 – 1,000 new podcasts under the Financial Samurai brand. I’m sure I’ll meet many new podcast listeners and podcasters as well. There is no doubt in my mind that if I keep up my efforts, I’ll become a better podcaster and communicator as well. You just never know where your new venture will take you. Good luck everybody! Luck favors the bold! 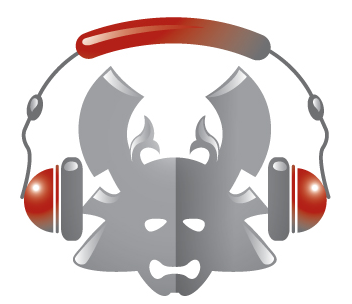 Big props on making your podcast official! Getting stuff off the ground is really hard especially with technical stuff being a pita a lot of times on the back end. I really enjoy listening to your podcasts as a compliment to reading your articles. Great efforts!! I listen to Sam whenever I have a moment, and I think he’s being modest in his article because he totally sounds like he knows what he’s doing! He’s articulate, warm, and has a good voice. I just did a crash course on public speaking, and it is not easy! As for starting a podcast myself? I think I’d like to warm up with a few interviews on OTHER people’s podcasts before I even THINK of doing one myself!